Is it Really Necessary to Warm Up Your Car in Winter? 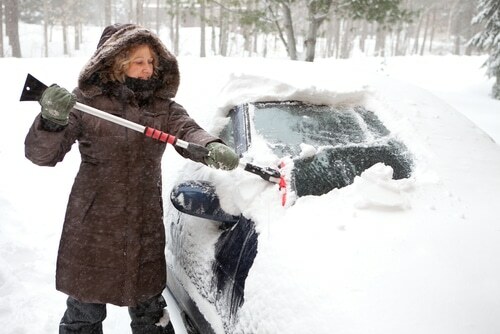 A rigorously held belief among many drivers is that warming up the car prevents damaging the engine in cold weather. While you want to avoid over-revving a cold engine, driving gently is a better way to heat up the engine than idling it for 10 or 15 minutes before you leave for work. The only legitimate reason to idle your car is if the windshield is covered with ice and you need help from the car’s heater to melt the ice so you can scrape it away. Otherwise, it’s best to just throw the car into gear and go. It might start out as a chilly ride, but once you learn the real facts about idling your car, you’ll realize a few minutes of slight discomfort is worth it. If the goal is to avoid hurting your car by not driving it when the engine is cold, you’ll be disheartened to learn that driving is actually a much more efficient way to warm up the engine than idling. Fuel is only partially combusted and the engine doesn’t operate at peak temperature when the car sits idling in the driveway. This forces the car to operate in an inefficient, gas-rich state that can cause fuel residue to build up on cylinder walls over time, degrading engine performance and reducing gas mileage over the life of the vehicle. If you find yourself waiting outside someone’s house or at one of Fort Collins’ many railroad crossings, do your wallet a favor and turn off the engine. After just 10 seconds of idle time, your car has already consumed more fuel than it takes to restart the car. Idling is bad for the environment. According to estimates by the Hinkle Charitable Foundation’s Anti-Idling Primer, a V-8 engine car wastes 20 gallons of gas after idling for five minutes per day over the course of one year. This doesn’t sound like much, but multiply this car by 100,000 other cars and that’s an extra 44 million pounds of carbon dioxide needlessly emitted into the atmosphere each year. Do your part and cut idling from your daily routine to help reduce carbon dioxide emissions. Idling is hazardous to your health. Increased vehicle exhaust in the air is hazardous to human health. According to the language used in the Minneapolis anti-idling ordinance, exhaust causes increased rates of cancer, heart disease, lung disease, asthma and allergies. Children are especially vulnerable because they inhale a larger amount of air per pound of body weight than adults. A New York City study showed that children with higher exposure to vehicle exhaust suffered from lower IQs by age 5. Idling in the garage can be fatal. Idling your car in the garage is even more dangerous. Carbon monoxide and other fumes accumulate here as your car runs, even if the door is wide open. Exposure to high levels of carbon monoxide can cause CO poisoning, which can lead to unconsciousness and death. If the garage is attached to your house, the fumes can build up inside as well, causing symptoms of lower-level CO exposure in your family members, including headache, nausea, shortness of breath, dizziness and lightheadedness. If you need to idle your car for any reason, never do so in the garage! To keep your car and the environment in good condition, don’t just avoid idling; also remember to bring your car in to Scott’s Fort Collins Auto & Repair for regular tune-ups, inspections and repairs. Stop by anytime! You can also schedule an appointment online or call ahead at (970) 682-4202. For your convenience, we provide free loaner cars for qualifying repairs.